How do you like to store your embroidery floss? Are all your threads well organized or could they use a bit of help? Bobbins are a classic way to keep floss tidy, and with this printable version you'll never run out! Some stitchers bring fresh skeins of thread home from the store and immediately wrap them on bobbins. Others wait until they have the start of a tangled mess. But either way, having a stack of these ready to go means you can always be ready to organize your floss collection. These bobbins have a light linen texture printed on them, and they are designed to fold for added stability. Additionally, they are a little larger than standard bobbins, but they'll still fit in your favorite bobbin case. Simply turn them so they line up the other direction. If you don't want to make a whole case of bobbins, you can punch a hole in the top and hang them on a ring. Plus, there's room to write the color number. It's so handy for taking a project on the go! To prepare your bobbins, download this printable JPG. There are eight bobbins per page. Print the JPG on card stock. Heavier card stock is best because it will keep your bobbins strong and prevent them from folding as you wrap them with embroidery thread. When printed in high resolution at 100%, it will fit on a US Letter size page and each bobbin should measure 4.25" x 1.5". It's important that the size is accurate so that they will fit in a floss box. If they print at a slightly different size, for example, if you are using A4 size paper, they should still work. Just be sure to try one in a floss box before making too many. Cut out around each shape and fold in half on the dotted line. With the bobbin still folded, snip the small solid lines. Open the bobbin and fold the sides in on the dotted lines. These folds create space for the floss while strengthening the bobbin. Fold the bobbin closed again. It's a good idea to stick the layers together with glue or double-sided tape, but once you wrap the floss around it, the bobbin will hold together on its own. Wrap the embroidery floss around the bobbins. If you want to prevent the end from unwrapping, you can snip a small slit in the bottom and slide the end of the floss through the cut. At this point, you can also write the thread color/number and add a small punched hole in the top. Repeat with each of your embroidery threads. 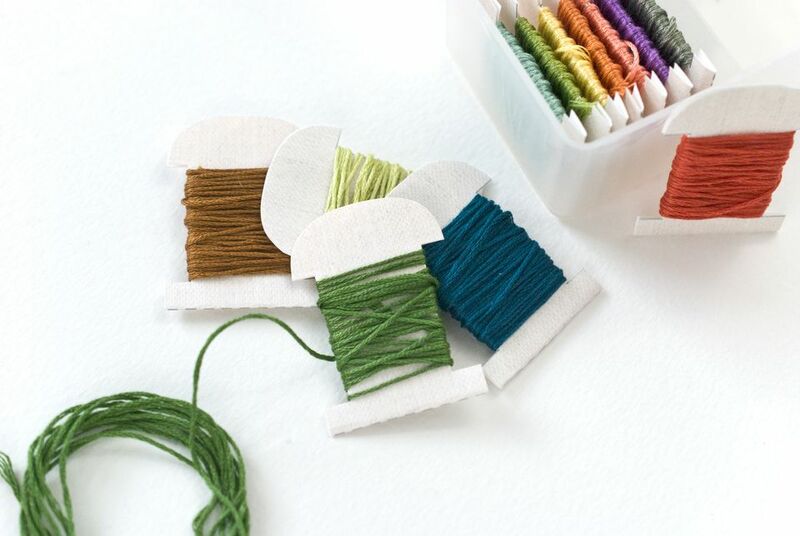 You can wrap your standard 6-strand cotton thread on the bobbins, but they also work great for other types of thread that you want to get more organized. And to keep your floss looking pretty, organize the bobbins in rainbow order so they're ready for your next color-filled project!